Why choose studying at the Faculty of Catholic Theology? 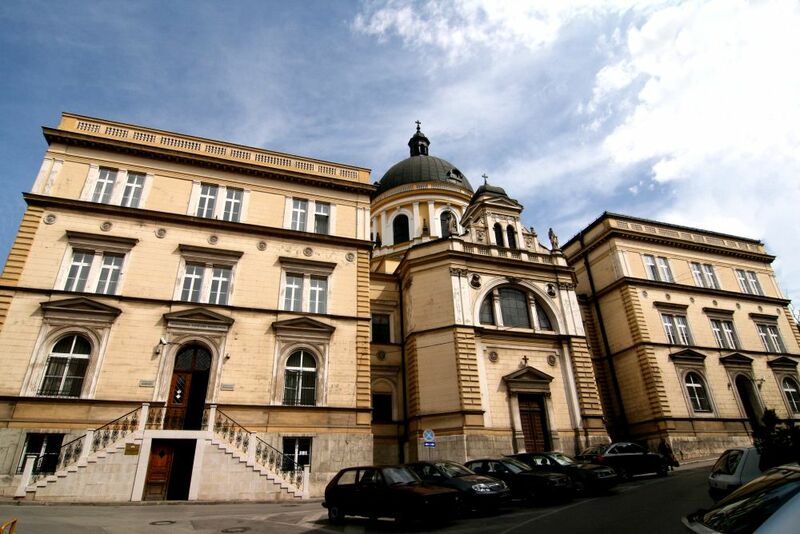 The Faculty of Catholic Theology is a higher education institution that organises and conducts university-integrated philosophical and theological studies which last for five years (300 ECTS). After graduating, one obtains the academic degree of the Master of Theology. The Faculty is based on the foundations of the oldest higher education institution in B&H, the Vrhbosna Catholic Theology, founded in 1890 by the first Archbishop of Vrhbosna, Dr. Josip Štadler. Since its foundation, this higher education institution has been carrying out its mission of educating priests. In addition to this task, the Faculty of Catholic Theology today endows Catholic laity with knowledges so that they can take over their share of responsibility in Church and society. The Faculty performs its mission of spreading the Kingdom of God on earth and brining glad tidings through scientific research, the systematic and complete presentation of Christian revelation, the improvement of the knowledge of its truth through philosophical and theological sciences, the development of Christian philosophical and theological thought, the promotion of ecumenism and dialogue with all Christians, promoting dialogue with non-Christians and non-believers, with the world and culture. The Faculty organises and conducts a university integrated philosophical and theological study, which lasts for five years (300 ECTS), and by its completion one gets the academic degree of the Master of Theology. From the academic year 2017/2018, the Faculty, in co-operation with the other two theological Faculties in Bosnia and Herzegovina, the Faculty of Islamic Sciences of the University of Sarajevo and the Faculty of Orthodox Faith in Orthodoxy of St. Vasiliy Ostroski in Foča, University of East Sarajevo, conducts a joint master study of Interreligious Studies and Peace Building. The programme is of interdisciplinary character and includes the scientific fields of interreligious studies and peace building. It is primarily intended for graduates of theological faculties, and social and humanistic sciences who express interest in inter-religious studies and peace building. By completing a one-year study (4 + 1), (60 ECTS credits), the candidate is awarded the academic title of Master in Interreligious Studies and Peace Building. Studying at the Catholic Faculty of Theology enables students to enrol in specific broad-spectrum education by enabling them to work and contribute to building their own personality through the acquisition of knowledge, values and attitudes that create a better approach to life and the entire reality. After graduation, one is enabled for priestly and secular pastoral work, for the qualified proclamation of Christ’s message. Master of Theology is provided with the opportunity to work in scientific research in the field of theology, humanities and social sciences, in the field of religious education and education in church communities, at school, in pre-school institutions, in social media, in church administration, in providing spiritual assistance, work in mission countries, etc. By enrolling at the Catholic Faculty of Theology, you become a part of this living organism that grows and evolves, striving to remain faithful to its long and rich tradition as the warrant of a safe future. By building together on good foundations, in the spirit of Christian faith and churches, we are responsible members of the society who think critically, empowered to contribute to the universal good.